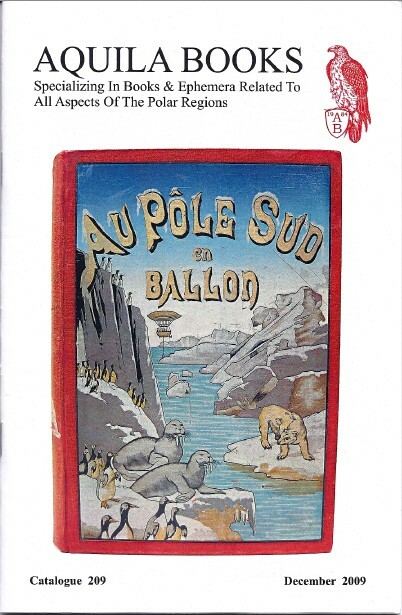 On to the poles with Aquila Books. Aquila Books, the specialist in books about the Arctic, Antarctic, and other regions far to the north or south, has issued their Catalogue 209. It is filled with accounts of explorations of the most inhospitable regions on Earth. How anyone could take on such extreme dangers and discomfort, some spending years at a time in these bitter regions, is hard to fathom, but they did. Here are some of their amazing stories. We will start with one of the great stories of polar adventure. It is the account of the Amundsen expedition to the South Pole. Norwegian Roald Amundsen hoped to be the first to reach the North Pole, but after Cook and Peary's claims (disputed) to having reached that pole, he set his sights on the other one. This would result in a conflict, as Englishman Robert Falcon Scott already planned such an expedition. The race was on. Amundsen and his men gathered up their supplies, dogs, and sledges, and headed for the South Pole. The Norwegian was already well versed in the habits of those who lived in the far northern climates. Scott relied more on his own ingenuity and brute strength, men dragging their loads behind them. Amundsen proved to be the more realistic. He made his journey with amazing speed and lack of difficulties considering the nature of his trip. He reached the pole first. Scott finally made it a month later, and he and his men died in the storms on the way back. Item 2 is the first English language account of Amundsen's journey, The South Pole. An Account of the Norwegian Antarctic Expedition in the "Fram," 1910-1912. Item 3 is the first Norwegian edition of the same work, Sydpolen... Each was published in 1912 and each is priced at $9,500. Amundsen cancelled plans to travel to the North Pole as others had already been there, or so he thought. Cook's claim was discounted by most observers years ago, but Peary's claim has come under great scrutiny in the past few decades as well. Some observers believe his claim to be inaccurate too. Perhaps if Amundsen had been aware that challenges would arise, he would have attempted to go north, but he was not aware that controversy would in time arise. So, who then was the first if Peary and Cook's claims are not correct? The first verifiable claim to have reached the North Pole by land (or ice) belongs to Wally Herbert and the British Trans-Arctic team, which made it to the pole in 1969. They departed Barrow, Alaska, early in 1968, wintered over on the Arctic ice, and made it to the North Pole on April 6, 1969. From there they continued on toward Europe, ending their journey on Spitsbergen Island, Norway. Item 46 is his account, published in 1969, Across the Top of the World. The British Trans-Arctic Expedition. $75. Item 77 is an advertising brochure for a German film set in cold northern climes, S.O.S. Eisberg (iceberg). It is chilling for more reasons than one. Pictured on the cover of this circa 1933 brochure is film star Leni Riefenstahl. Ms. Riefenstahl was at the time transitioning from actress to film director. Her technical skills were exceptional, but her moral compass lacking. She became enamored with Hitler and his associates and went on to make propaganda films for the Nazis, later denying they were really Nazi propaganda. She spent the rest of her life pretending she really didn't know what the Nazis were doing and that she was nonpolitical, despite tons of written and photographic evidence to the contrary. The result was a lot of protesting as she lived until 2003, dying at the age of 101. $150.